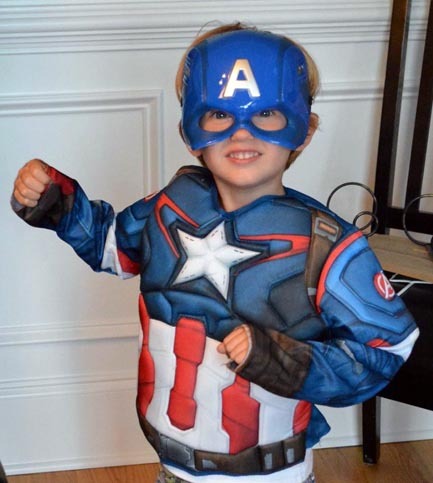 Matthew will soon be four, and to celebrate his upcoming birthday, our gift to him was a “Captain America” outfit! 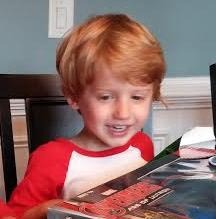 Matt was so excited when he opened his present. He had to put his costume on right away and go for a walk around the neighborhood looking for bad guys. 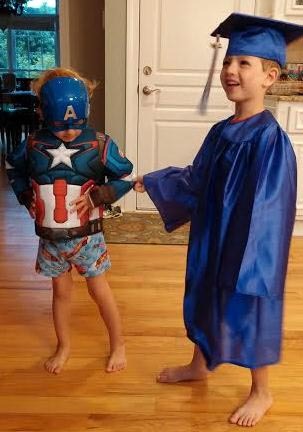 As we walked, I told Matty I really liked him in his Captain America suit and he immediately came to a halt, put his hands on his hips and said, “This is not a suit, Yaya! I am Captain America!” Hmmm, what, exactly, did we give Matty for his birthday? Of course, Jake, thought Matty was silly. Jake is older (he’s almost six) and wiser (a pre-school graduate! ), and he’s been around the block a few times, too (though never alone!). Jake knew Matty was not Captain America, he was just Matty in a costume. What a vast gap there is between ages six and four. We thought Matt’s gift was nothing more than a foam-muscled shirt and a plastic mask, but when Matthew put it on – Bam! He totally changed! His posture straightened. His voice deepened. His gait strengthened. His courage grew. His fists clinched. He crunched his goldfish crackers harder. 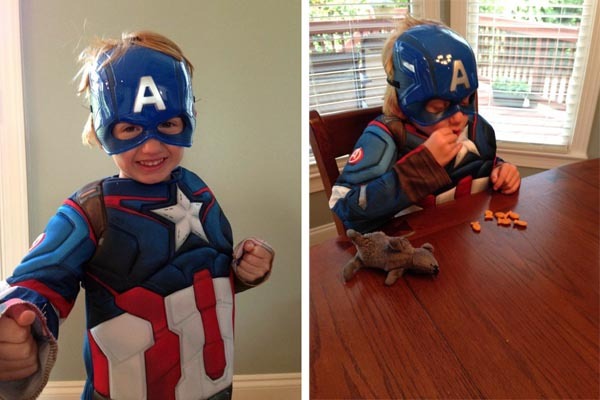 He became Captain America… until bath and bedtime. Captain America proved to be a temporary identity; a façade that was easily removed when real life crept in. With the costume on Matty thought he was a super-hero, and acted like one. However, there was no real change; with the mask off, Matty was the same little Matty he’s always been. Unfortunately, there are people who wear Christianity like a costume; one that is easily put on for a while and then removed when real life creeps in. When the mask is removed the same natural person is still there — a person who is impatient, joyless, angry, bitter, quick to judge, depressed, unhappy, discontent, complaining, or grumbling — a person who has no power to change his or her nature. The truth is that we cannot change our hearts — our nature — simply by willing them to change. Our hearts naturally beat to the rhythm of sin. In order to find a new pattern, our hearts must be renewed – our nature must be changed from the inside. Only God can change our nature. Only God can regenerate a heart. Only God has access to your heart to transform you from the inside out. God will begin this work in you the moment you say “Yes” to Jesus. When you ask Jesus to come into your life and heart, when you receive him into your person, it is in that instant that your heart is changed. Your salvation is a work that is entirely of God. However, God will not force behavioral change upon you; your sanctification, your growing as a Christian, is accomplished as you cooperate with the Holy Spirit. As you yield to God, choose obedience, study his word, and fellowship with other Christians, you will find that you are changing in ways you never imagined. You will notice a new authenticity in your life and relationships. You discover that you no longer need a costume because the supernatural in you, Christ, overtakes the old natural you. We choose how we live. We have the freedom to live our lives as instruments to do what is right for the glory of God (Romans 6:13). If we are genuine Christians our goal in life is to live in such a way as to bring honor to God all the time. We choose authenticity — no pretending, no costumes, no masks — in every area of our lives. If you can easily put on or take off a Christian costume — a Christian persona — as circumstances dictate, are you really an authentic Christian? Or are you a Captain America Christian? Hope you are doing well, thank you for your insight and postings which always speak to my heart in a way that helps me to make personal applications and âthink on these thingsâ. Were you in the area of those storms that went thru Texas? All is well? Keep sharing your insight and daily life applications from Godâs Word with us, be encouraged. It’s not easy to walk the talk.